Merneptah or Merenptah (reigned July or August 1213 BC – May 2, 1203 BC) was the fourth ruler of the Nineteenth Dynasty of Ancient Egypt. He ruled Egypt for almost ten years from late July or early August 1213 BC until his death on May 2, 1203 BC, according to contemporary historical records. 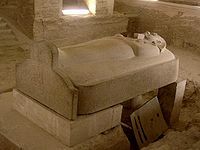 He was the thirteenth son of Ramesses II and only came to power because all his older brothers, including his full brother Khaemwaset or Khaemwase, had died. By the time he ascended to the throne, he was probably around seventy years old. His throne name was Ba-en-re Mery-netjeru, which means "The Soul of Ra, Beloved of the Gods". Merneptah was probably the fourth child of Isetnofret I, the second wife of Ramesses II, and he was married to Queen Isetnofret II, his royal wife, who was likely his full sister bearing the name of their mother. 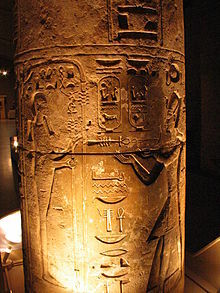 It is presumed that Merneptah was also married to Queen Takhat and one of their sons would succeed him as Seti II. They also were the parents of Prince Merenptah and possibly the usurper, Amenmesse, and Queen Twosret, wife of Seti II and later pharaoh in her own right. 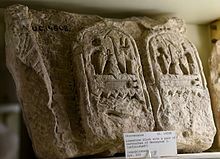 Merneptah was probably the thirteenth son of Ramesses II. This is a result of the latter's advanced age and the fact that he outlived many of his heirs (In his 90s, Ramesses was one of the oldest pharaohs in Egyptian history, if not the oldest). By year 40 of Ramesses II, Merneptah had been promoted to Overseer of the Army, and in year 55 of Ramesses II, Merneptah was officially proclaimed heir and crown prince as Ramesses celebrated his eightieth birthday. After becoming heir, Merneptah took on new responsibilities in administration, mainly becoming prince regent for his elderly and perhaps senile father for the last twelve years of the king's life. According to one reading of contemporary historical records, Merneptah ruled Egypt for almost ten years from late July or early August 1213 BC until his death on 2 May 1203 BC. Merneptah was already an elderly man in his late 60s, if not early 70s, when he assumed the throne. Merneptah moved the administrative center of Egypt from Piramesse (Pi-Ramesses), his father's capital, back to Memphis, where he constructed a royal palace next to the temple of Ptah. This palace was excavated in 1915 by the University of Pennsylvania Museum, led by Clarence Stanley Fisher. ^ "King Merenptah", Digital Egypt, University College London (2001). Accessed 2007-09-29. ^ Merrill, J. Marc (2012-05-02). 1: Building Bridges of Time, Places and People: Volume I: Tombs, Temples & Cities of Egypt, Israel, Greece & Italy. AuthorHouse. p. 213. ISBN 978-1468573695. ^ Bart, Anneke. "Merneptah". slu.edu. Saint Louis University. Retrieved 2017-12-21. Merneptah was the 13th son of Ramses II. ^ "Penn Museum - Egypt (Sphinx) Gallery". Penn Museum. Penn Museum. Retrieved 2017-12-21. Merenptah was the 13th son and eventual successor of the famous Ramses II. ^ "Merneptah". Academic Dictionaries and Encyclopedias. Retrieved 2017-12-21. Already a man in his sixties, Merneptah had helped to manage state affairs for his father in the city of Pi-Ramesse and in the Delta and he now took on new responsibilities, ruling as prince regent for the elderly king throughout the last twelve years of his reign. ^ Joyce Tyldesley (2001). Ramesses: Egypt's Greatest Pharaoh. Penguin Books. p. 185.